In my discussions with retired college coach Ken Woody, we have noted the decline of the Oregon passing game beginning in 2016 and how far it appears to have descended. Is it due to limited routes and pass plays, the lack of receivers’ skills or a lack of confidence in the wide-outs? 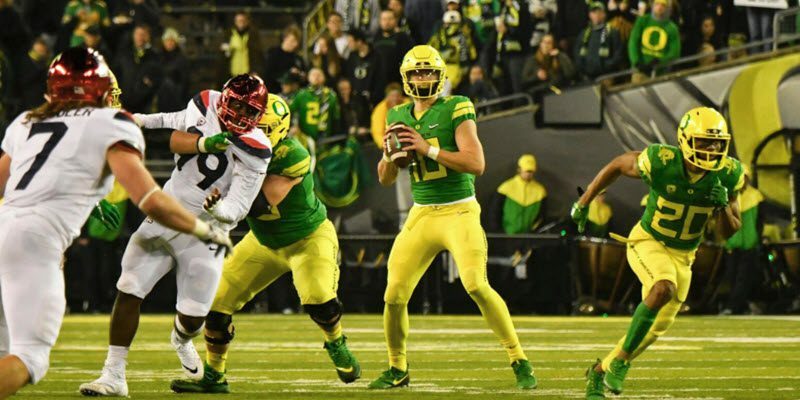 Let’s take a look at a few examples from last season to get some clues as to what to look for at the Spring Game and observe Oregon’s progress in the passing attack, featuring Heisman-like quarterback Justin Herbert. (Please note that the majority of comments below are from Coach Woody). In the above example, you can see why the Ducks could only get 43 yards rushing the entire game, and once again, an opportunity for quarterback Justin Herbert to burn one-on-one pass coverage on both sides of the formation is ignored. How so? 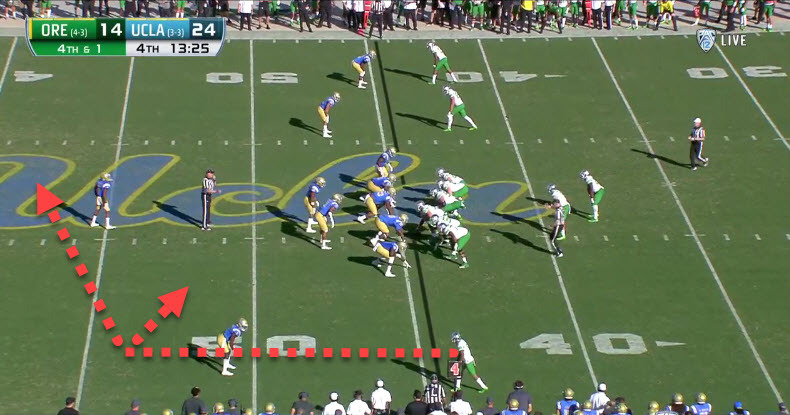 The corners are in man-coverage on Oregon’s wide-outs and the safeties are playing up close. 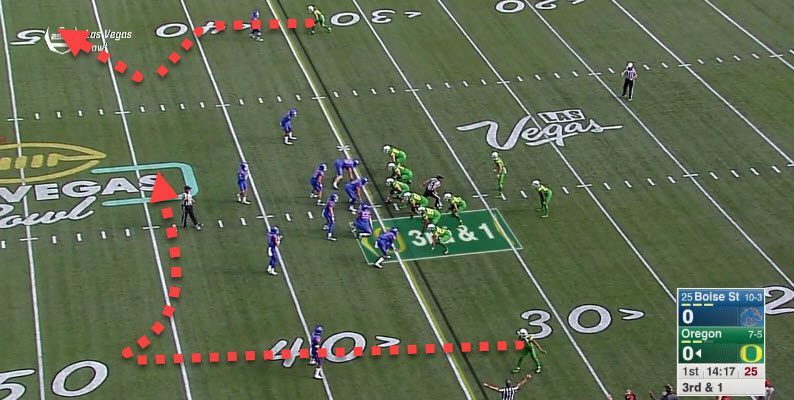 In the Las Vegas Bowl, the Boise cornerbacks (above) on both sides of the Ducks’ formation are isolated against Oregon’s receivers, each of who should be able to use 26½ yards of field width to get open on either quick or deep routes. The rest of the Boise defense is dug in, anticipating the running play that they easily stop. 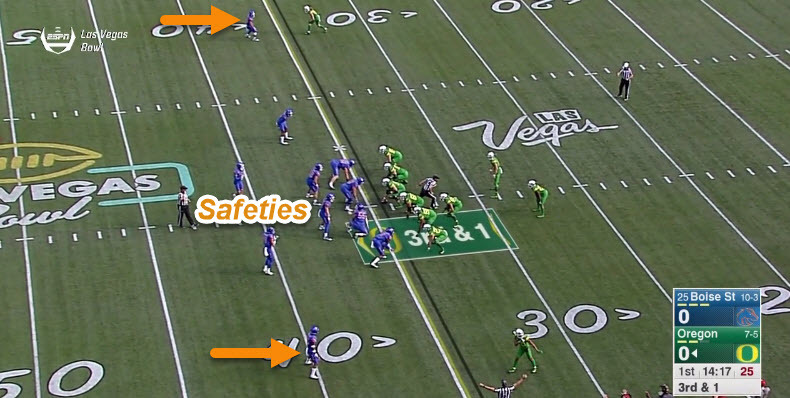 Notice how close the Bronco safeties above are playing to the line-of-scrimmage, unable to help their corners if the Ducks run a play-action pass. The cushion given to the receiver at the bottom of the screenshot above shouts for a quick post or deeper square-in to attack the wide open area in the middle of the field, while the receiver at the top could run a post-corner against a corner who is also without safety help. If Pac-12 receivers can’t get open against corners who don’t know what route they are defending, then it will be a long, sad season. A play-action fake would also allow maximum pass protection with eight offensive blockers and provide the quarterback with enough time to pick the open target(s). By being so predictable in short-yardage play calling, Oregon had consistently set up their opponents to be gashed by a play-action pass, but the play caller(s) were either stubborn about proving themselves with a run call or afraid to attempt a pass play. An offense can’t make big plays if the coaches don’t attempt any big plays. Once again (for the 9th time in 11 tries this past season), the Duck rushing offense (above) is stuffed attempting a fourth down conversion, this at a time in the UCLA game when the score was still close. On most of the attempts this past season, it was Royce Freeman who was stopped, but this time Braxton Burmeister botched the read and fumbled on the option play for a loss of four yards. The cushion is extreme—plenty of room for a play-action pass. A better choice would have been a play fake to Freeman and a throw to Charles Nelson, the wide receiver on the left. The freshman corner is laying off Nelson, and the safety is ignoring the possibility of a pass play. They both know Oregon has not passed in this situation and probably never will. Nelson could run a hitch, an out or fake a post and run deep and most likely beat the corner on any route the way he is defending him. The free safety’s reaction to the run action shows that he could not help his corner on a play-action pass. The Ducks passed up an excellent opportunity to convert on fourth down and possibly execute an explosion play that the offense lacked during the middle of last season. Opportunities like this existed often in the 2017 season, and it is hard to know why such easy pickings were ignored. Perhaps a year of experience will help some of the younger wide-outs give confidence to Coach Mario Cristobal and inspire the coaching staff to implement a more aggressive passing attack. This would provide balance to the offense and enhance the running game due to the unpredictability of play-calling. For the fans—it offers that much more to watch for in the Spring Game and fall camp. Buy the book here to learn from Coach Woody or to give the gift of football. Ken Woody is a former Fox Sports football commentator who played defensive back, receiver and kicker for Oregon from 1966 to 1970. He coached college football for 18 years, including stints as an assistant coach at Oregon, Washington, Washington State and Utah State, and he was head coach at Whitman College and Washington University-St. Louis. He writes “X’s and O’s,” a weekly column in the Register-Guard, RG online coverage of Duck football and is the author of After Further Review: A Fan’s Guide to Understanding What’s Really Happening on the Football Field.